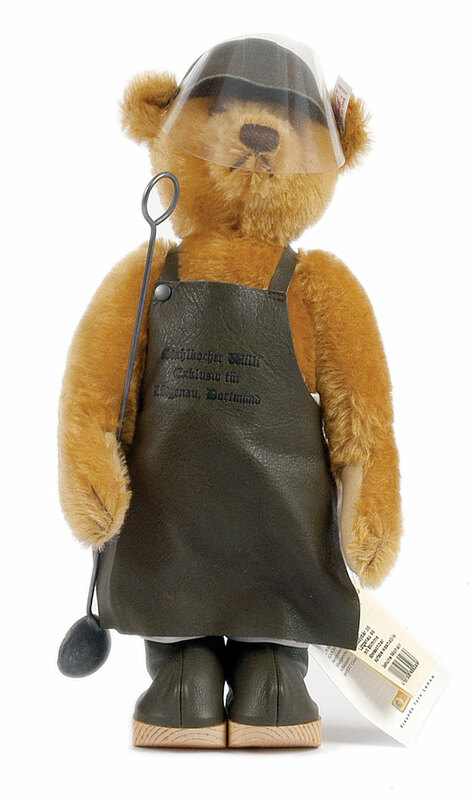 A big 'hello' to Willy the Steel Worker, made as an exclusive for the Lutgenau Department Store in Dortmund, Germany by the master-makers Steiff. Willy is 13.75" / 35cm tall and fully jointed. He has been sewn from a luxurious cinnamon mohair with warm wool felt paws, glossy two tone brown eyes and a matching hand stitched brown nose, giving a gentle appeal. 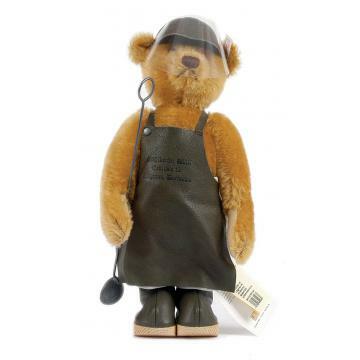 Being used to working with heat and metals, Willy is suitably attired in cream fabric trousers, a protective full length, leather apron along with a peaked leather hard hat complete with visor, plus thick wooden soled, leather boots. In his paw he carries his long handled steel ladle. Just fabulous. This wonderful piece, depicting a career within the Steel industry is an Exclusive for Lutgenau (Leuthgenau) Department Store in Dortmund, Germany and is a Limited Edition of 1,500. His numbered certificate of authenticity comes attached and he will arrived boxed.